Thank you for stopping by for the Feature Friday post. This is a new series dedicated to highlighting leaders, educators, and innovators. 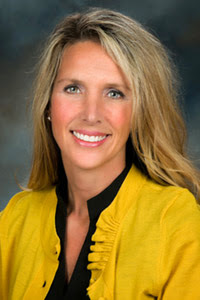 Today's feature is on Daisy Dyer Duerr, K-12 principal of St. Pauls Schools in Arkansas. Daisy is about being a champion for her students in rural Arkansas. She is a person who makes things happen, a skill she honed during her days as an athlete and coach. She was named a 2014 NASSP Digital Principal Award Winner, and was a finalist for a 2014 Bammy! Award. She loves all things tech, and her passion and ability to make things happen has resulted in her schools being technology-infused, which has given her students access to opportunities that they didn't have previously. Daisy is the founder of #ArkEdChat, a weekly twitter chat, and you can follow her at @DaisyDyerDuerr. Her website is www.DaisyDyerDuerr.com. Time with my family, sports (Football, Basketball), & all things education! Follow 1 Rule= "DO RIGHT"....from my basketball coach 6-12th grade. Everything Todd Whitaker, Digital Leadership; Changing Paradigms for Changing Times, Drive, Seven Habits for Happy Kids, Five Point Play, Whatever It Takes, Gone With the Wind......so many more great education books....! I wanted to increase my sphere of influence on students....this is when I really began to believe "making a difference with students" was going to be my life's work. Flying....who doesn't want to fly! Charles Berry (High School Basketball Coach), My Father (Joe Logan Dyer III), & too many educators to name!